Dahl is a delicious way to enjoy a large dose of veggies for dinner. 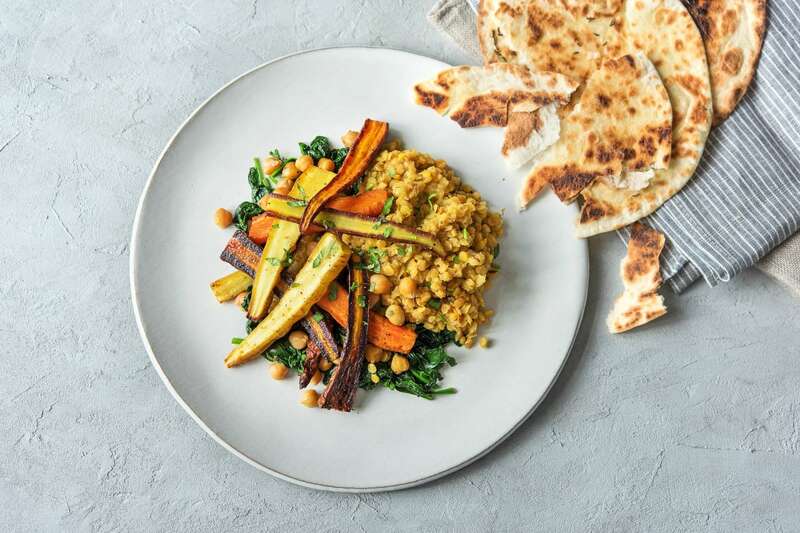 This dahl is made with chickpeas, spinach and colourful chantenay carrots. These little carrots are packed full of flavour and nutrients, and are a tasty addition to this Indian dish. If all this wasn’t enough, we have also included cheat’chapatis, which make the best little shovel to scoop up your dahl! Preheat your oven to 200 degrees. Cut the tops off the carrots then slice your white and purple carrots in half lengthways (no need to peel). Slice your orange carrots into four strips if they are a bit thicker. 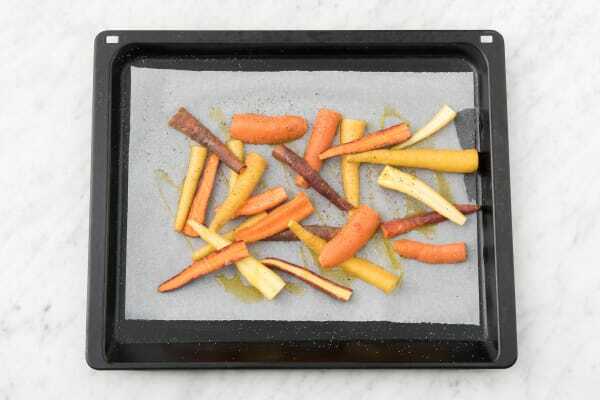 Pop your carrots onto a baking tray. Drizzle over a glug of oil and season with a good pinch of salt. Sprinkle on two thirds of the Poudre de Colombo, mix well and then roast on the top shelf of your oven for 25-30 mins. Turn after 10 mins to make sure they cook evenly. Whilst your carrots cook, cut the shallot in half through the root. Peel and slice into thin half moon shapes. Peel and grate the garlic (or use a garlic press if you have one). Roughly chop the coriander and drain the chickpeas into a colander, and keep to one side. Heat a saucepan over medium heat and add a splash of oil. Add your shallot and a pinch of salt. Cook for 3 mins until soft and then add half your garlic and half the cumin seeds. Cook for 1 minute more and then add your remaining Poudre de Colombo and the red lentils. Add the water (amount specified in the ingredient list). Bring to the boil and stir in the vegetable stock pot. Make sure it is dissolved and then reduce the heat and simmer gently for around 20 mins. 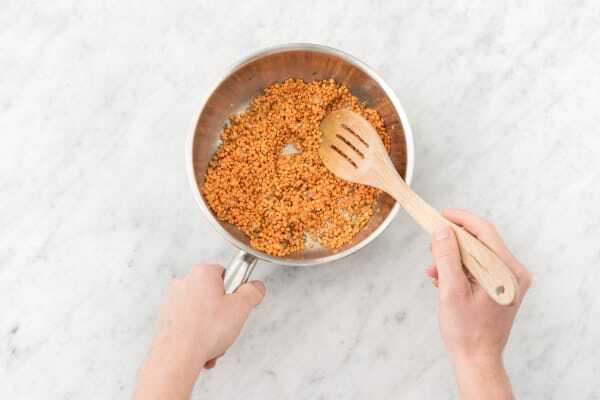 Heat a frying pan over medium heat and add your remaining cumin seeds. Dry fry for 1 minute, then add 1 tbsp of oil per person. Stir in the rest of your garlic, cook for 2 mins then pour your flavoured oil into a small bowl. 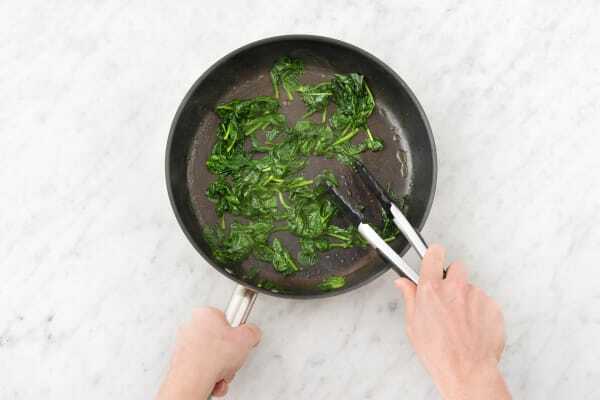 Wipe your frying pan with kitchen paper and pop it back on high heat. 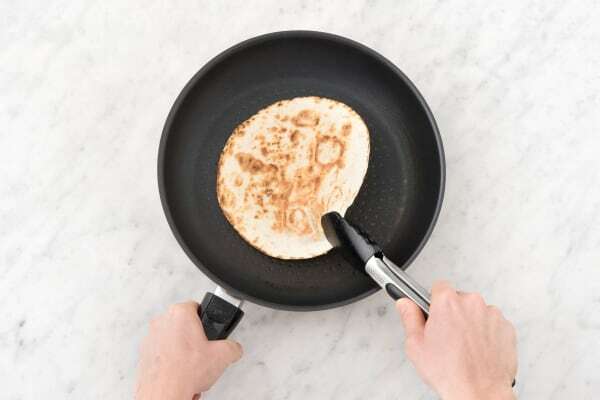 When the pan is hot, dry-fry the wholemeal tortillas for 30 seconds on each side. You want your tortillas to char slightly, so keep an eye on them. Transfer each tortilla to a plate making a chapati pile and drizzle some of your flavoured oil over each one. Keep them warm by covering the plate with foil. When your carrots have 5 mins left in your oven, pop your chickpeas onto the baking tray as well and roast for 5 mins. Put the (now empty) frying pan on medium heat and add a splash of oil. Add the baby spinach and cook for 2-3 mins or until completely wilted. Season with a pinch of salt and a generous grind of black pepper. Share your spinach out between your plates and top with your carrots and chickpeas. Check the seasoning on your lentils and add more salt and pepper if needed. Spoon alongside your spinach and carrots. Finish with a sprinkle of coriander and serve with your chapatis. Yum!